The just-ended CEA registered a positive remark on the thrilling performances by Cameroonian artists like Luxland, Naomi Achu ,Myra Maimoh and Maybelle Boma. The girly girly” R&B crooner Luxland performed alongside BsCarz and Dablu . CAMEROON ENTERTAINMENT AWARDS (CEA) – Enthralling moments! The embers of the highly-anticipated inaugural edition of Cameroon Entertainment Awards (CEA) are gradually dwindling and the appraisal has been positive so far. The list of the winners shall be published here in the days ahead. NexDim presents to you some stunning photos of the event courtesy of the organising team of Cameroon Entertainment Awards 2012. Stay tuned for updates. Entry tickets for the maiden edition of the Cameroon Entertainment Awards, CEA have been on sale for quite some time now. Initially sold at $100, the price has dropped to $50 to enable guests come to the event in their numbers. According to the Executive Producers of CEA, Maybelle Boma and Anne Etape, Americans who recently discovered their roots in Cameroon and commonly known as CamAmericans now are leading the CEA ticket purchase. This group would unconditionally endorse any initiative aimed at building and safeguarding the image of Cameroon, a probable reason why they have engaged the ticking buying with no resentment. CEA tickets in their numbers. On the other hand, Nigerians and Senegalese have launched a CEA ticket purchase competition and are rushing for them. In short, reports say these communities have pulled out the greatest number of CEA tickets from the sales box so far. Explaining this trend, CEA organizers see the presence of P-Square (nominated in the best Pan African artist category), Akon and Viviane N’dour (same category) and Genevieve Nnaji, Omotola Jalade, Jim Iyke and Stella Damasus (best Pan African actress) as reason for the massive purchase of tickets by Nigerians and Senegalese respectively. Cameroonians have been procuring CEA tickets since the launch of sales. They have expressed a lot of interest in the event and are doing everything to be part of history-making. Yet, according to sales records, they are still trailing their counterparts from Ghana, Nigeria and Senegal. They are however expected to pick up, especially as the event draws near. Initially sold for $100, the cost of the CEA entry ticket has been dropped to $50. According to Maybelle Boma, Executive Producer, this reduction is meant to enable as many guests as possible show up for the event they so bad await. The reduction went into effect on June 6 2012 and will run till June 30. From July 1, 2012, the cost of the tickets will return to $100 and at that time will be limited. The official trailer of the Cameroonian Entertainment Awards, CEA is being produced in studio and will be released on June 15. According to Maybelle Boma, the release of the trailer will put things on a higher gear. Meantime, some goodwill and well-wishing Cameroonian producers in the US have prepared and youtube tentative trailers for the event. The CEA organizing team is appreciative of this kind gesture which according to them is an exciting show of solidarity and concern for the event that seeks to promote Cameroon. 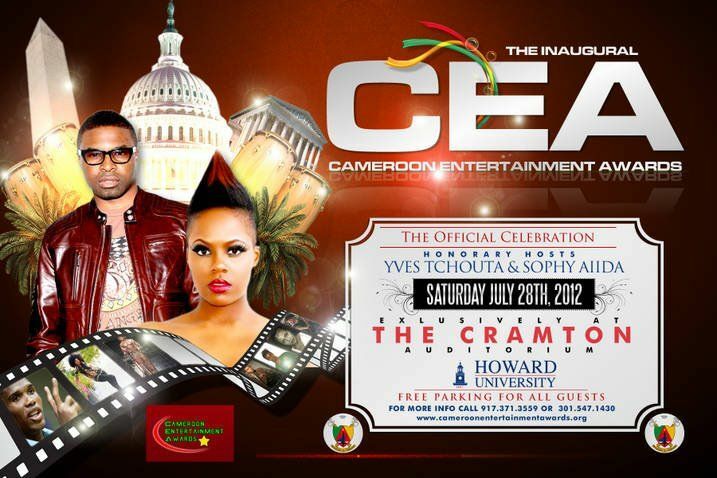 It’s now certain that Gabonese star singer Patience Debany will be physically present in Washington DC on July 28, 2012 to assume her prestigious position as “Mother of the CEA Awards”. The singer who has been in the US has confirmed her participation in the event which to her is a true sign of love for country, sub region and continent. Executive producers Maybelle Boma and Anne Etape have been speaking with Debany’s manager and the latter has indicated that everything is in place to have the artiste hit the CEA music stage come July 28. It is an uncontested assertion that the love and admiration Cameroonians have shown for Patience Debany is exceptional and has not commonly happened to others of late. The singer has created a record of fame in Cameroon that will not be beaten so soon. No sooner had On Vous Connait, her hit track reached Cameroon, than it sent the entire country on a chanting spree. For once we witnessed a Cameroon that had everyone chanting the same song at the same time. It was such a great honor that Debany’s On Vous Connait became a unifying piece of art work in Cameroon. Cameroon will forever remember such singing prowess and the positive impact this created on their music minds. As if that were not enough, Debany used her fame in a genuine manner by extending a humanitarian hand to the needy – her timely involvement in the challenging fight against Malaria which is one of Africa’s most dreaded killer diseases. Her influence as a renowned artiste and social mobilizer will definitely go a long way to reducing malaria incidence on the continent. We also praise her for putting hands on deck with Cameroonian superstar and football icon Samuel Eto’o to put smiles on the faces of the less privileged. The African children you are helping today are the stars of tomorrow and you would have contributed enormously in moulding them. Debany has also been a great inspiration to countless young girls in Cameroon, especially those who desire to be great singers like her. Many of them have been making efforts towards that and will always have you as their role model. Her invitation to CEA falls within the framework of good neighbourly and diplomatic ties between Cameroon and Gabon, which CEA also seeks to promote. 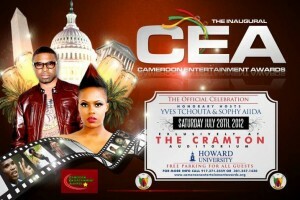 The Africa diplomatic corps in the US is increasing showing great consent for the Cameroon Entertainment Awards, an event that pays tribute a country usually described as Africa in miniature. Diplomats have been showing their solidarity and wish to see the maiden edition of the CEA succeed. What belongs to Cameroon, belongs to Africa, so they say. One of the latest African diplomats to buy in is the Congolese Ambassador to the US, Serge Mombuli. A spokesperson at the Congo-Brazzaville Embassy has been speaking with CEA on the Ambassador’s confirmed presence at Cramton come July 28, 2012. The Congolese Ambassador’s endorsement and presence at the CEA event will sure be a mark of good diplomatic relations Cameroon has been enjoying with his country in the Central African sub region. Such relations will be demonstrated again when he meets his Cameroonian counterpart Cramton. As we promised to bring you the rest of the nominees in the Cameroon Entertainment Award under films, fashion – best designers and models, here it is. It gives regard to our Cameroonian universities with much respects meted out to our legends and some outstanding Cameroonians over a decade and in some entire lifetime. All you have do is just check out the list below.